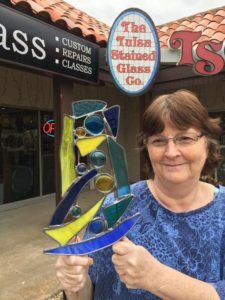 Tulsa Stained Glass and the Art Event Center have been providing stained glass services & classes in Tulsa, Oklahoma and surrounding communities since 1975. We pride ourselves on giving our customers the best possible experience. Check back often for new class dates. If you need to reschedule a class, please call us at (918) 664-8604. Space is limited and in order to ensure customer satisfaction & optimize availability we have a strict 48 hour cancellation/rescheduling policy. See fine print for more info. Learn the basic art & technique of the age old craft of stained glass. Skills learned include pattern-making, glass cutting, panel assembly, soldering and cementing. You’ll practice your skills while building a 10x16 leaded panel. You will also learn the additional technique required to build with copper foil. Upon completion of the course, you will have the fundamental skills necessary for making basic stained glass windows, mosaics and more. Adults only or 16 yrs or above if accompanied by a student parent. All students must sign waiver. Enjoy a fun introduction to the age old craft of stained glass. 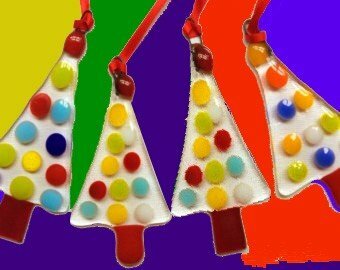 This four-week, 8 hour class is an overview of stained glass design and basic techniques for working with stained glass. Skills learned include design, pattern-making, glass cutting, copper foil assembly, and soldering, plus a fusing demonstration. Practice your skills while building a project to take home. The price of $99 includes instruction and all materials. Rescheduling and cancellations are only accepted up to 7 days before the event date. Call studio and our sales associate will be happy to assist you to cancel or reschedule. A 20% fee will be charged on cancellations. Allow 30 days for refunds. Tulsa Stained Glass reserves the right to cancel class due to low enrollment. Enjoy making and taking home a beautiful authentic stained glass ring project in this 2 hour class. Crafting lessons, materials for one ring (4″ ring and 9 glass nuggets), and use of tools are all included. 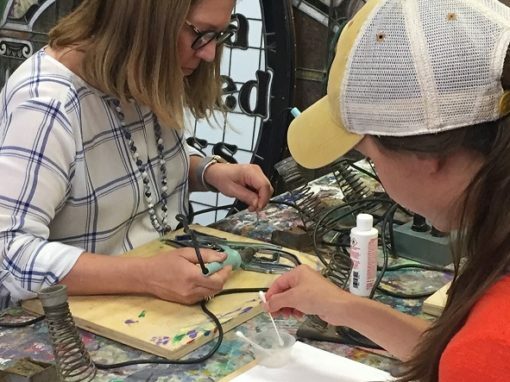 Participants will use the same glass and tools in class that are used for making custom windows in the studio of Tulsa Stained Glass; these are the same processes used to build authentic stained glass windows for centuries. There is no previous experience needed for this class series. The standard ring will have a cord attached for hanging. For an additional $5, a stake may be added (if time permits). 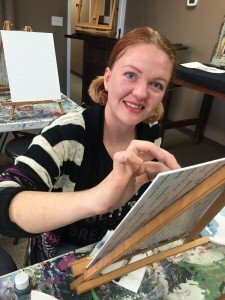 Nurture your creative spirit with a group painting exercise, then watch as it is turned into a stained glass design. Then experience the process of making Garden Spirits glass sculptures by building a 9-piece, up to 12″ x 4″ Mini Garden Spirit to brighten your garden year round. The class includes instruction, materials for 1 Mini Garden Spirit, use of our tools – you bring your imagination! 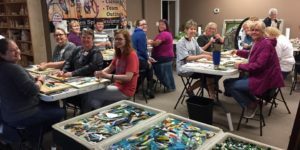 Participants will use the same glass and tools in class that are used for making custom windows in the studio of Tulsa Stained Glass. There is no previous experience needed for this class series. Must be 18 & older to attend or 16 & up if attending with a parent or adult guardian. All students must sign waiver. Class is for paid students only; unpaid observers are not allowed. Tulsa Stained Glass has a 48-hour cancellation policy. For questions, email us. Tulsa Stained Glass reserves the right to cancel class due to low enrollment. Class takes place at Tulsa Stained Glass & Art Event Center located at 4131 S Sheridan, Tulsa, OK 74145. On the east side of Sheridan, just south of 41st St. Call (918)664-8604 if you have questions. This party event can be modified to fit your group size, your time of day, etc. Your group will learn about the art of stained glass design, then build a stained glass Garden Spirit to brighten your home or garden. In this private party, you will experience the process of making Garden Spirits glass sculptures by building a 9-piece, up to 12″ x 4″ Mini Garden Spirit to brighten your garden year round. This private party includes instruction, materials for 1 Mini Garden Spirit, use of our tools – you bring your imagination! This party event can be modified to fit your group size, your time of day, etc. In this private party, the group is encouraged to create art on a canvas that could translate to a stained glass design. 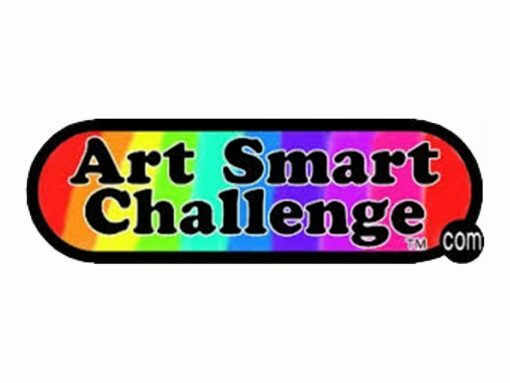 In this art exercise we hope you find new and untapped creative juices. Once the art piece is created it is then ready to hang. This group event nurtures the creative spirit. 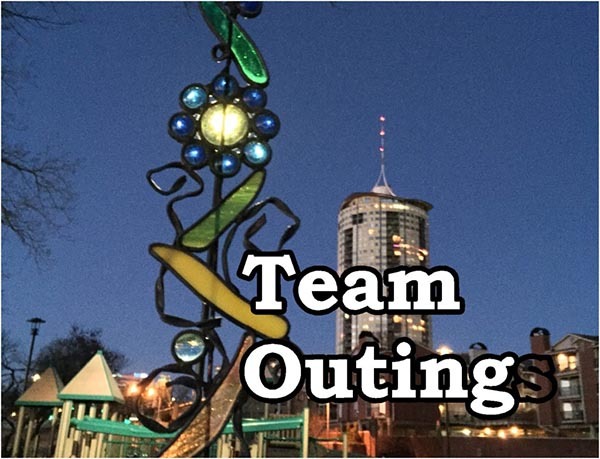 This party event can be modified to fit your group size, your time of day, etc. With mosaics your group will be applying precut stained glass in a creative fashion to a 6X6 tile. Quick & Easy.